Do you, by any chance know, a place to warm up when you feel cold, or get soaked to the skin, or a place where you are free to relieve the tension and may cool your body in stuffy and sticky summer days. That, for sure, is hamam, the old but everlasting one. Imagine yourself in Baku of the last century, wherein the least you will be surprised with would be the absolutely different view of the town, and an extraordinary variety of hamams, which have been, by far, the beloved place of Bakunians. The Hamam was a place where you sit back to relax and converse with friends and/or befriend the new ones while gossiping about town's most recent news, and even trying to find a perfect match for your son or daughter. Visiting hamam was much more than a mere bath taking thing, but rather was transformed into a tradition and ritual firmly entrenched in the minds of Baku inhabitants. On special occasion, men used to walk to the bath. One day before that, they were preparing items required for bath and money to pay for barber or message therapist services there. Men used to play backgammon and cards in the cloakroom, as well as rest on a typical Azeri khalcha (carpet) or couch while indulge themselves with tea or home cooked dinner. This is was the spot to discuss events occurred in the city or village and it was the very place to get ready for wedding ceremony. Women accompanied by kids took clothes needed to be washed and were used to go to the bath at a particular women day of the week. Usually, music, sounding from the central square, or from minaret of the mosque gave to understand that today is a women day. Moreover, red cloth with painted pictures of the scenes of famous plays "Layla and Majnun" or "Asli and Kerim" was hung on front of the baths. Mothers with daughters of marriageable age, as well as mothers who wanted to choose a bride for their sons also visited hamams. One could hear all the news of the city, and gossips' fans were indispensable visitors there. Public life in the baths was in full swing, almost the entire population of the city kept pace to have a bath in the weekends, and on Mondays, they proceeded to a new week in a clean and neat appearance. Personnel of the hamams consisted of a few people. A major figure here was the man, who poured hot water. He sat on a stone bench at the opening leading into the room where there was a storage with hot water - khazna and via the scoop on the long wooden handle he took the water and then poured to the jars in front of him. A boiler man - "kulhanchi" - controlled trouble-free operation of baths, regulating the water flow. 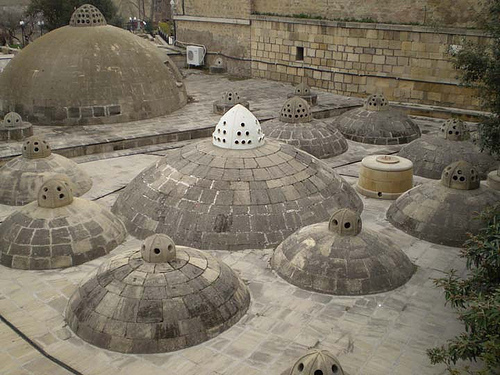 Hamams played special role in the architectural appearance of Baku. They were built mainly in a dome form that organically harmonized with the local landscape and helped the proper distribution of the condensed steam. Steam turning into water did not flow down from the ceiling, but from the walls without causing discomfort to visitors. Small openings arranged at the base of the dome were used for illumination in hamams, but light fell only in the center of the room. To make visitors move, bathhouse workers set oil or kerosene lamps at the corners of the room. Competition among the owners of hamams made them use the latest architectural details and decor to attract visitors, for what waiting room was decorated with colored tiles and mirrors ordered from abroad. Until the second half of the 19th century the heating system of Baku's baths worked using wood, which was burned in primitive heating boilers. Hot water was rising through the pipes by rotating the wheels, either manually or using a horse, and then were given to the stone bath, where people ladled it with special scoop. Later, water heating and heating systems in hamams were combined and became to be heated with fuel oil. Ceramic or metal pipes of the water supply system in Sheki, Shusha and Ganja or wells located in the courtyard of baths provided hamams with water. Speaking about heating systems of the East baths, it is worth mentioning an interesting device of bath in Iranian Isfahan city, which was heated from a single candle. Scientists did not believe that such a huge cauldron, providing a whole bath can be heated by a single candle. They dismantled it neatly to understand the device and maybe find some additional sources of heat, but found nothing. Then they gathered it also neatly, but the boiler has stopped working, and this miracle was lost. It is hard to find a literary work, written in any of the oriental languages, whether tale, story, poem or novel, in which hamam would not have been mentioned at least once. Some episodes of legendary Azerbaijani film "O olmasin, bu olsun" (If not this, then that) were filmed in the bath of Mikayil Aga, situated in Icherisheher (Old City of Baku). Moreover, famous Azerbaijani writer Maksud Ibragimbekov wrote the whole story, telling in details about bath traditions in Baku. Despite the fact that today not so many people go to the hamams, preferring the comfort of their home bathrooms or popular Finnish saunas, traditional hamams continue to operate in Baku in all its glory.